Dreadlock Dance hall artiste, Ibrahim Majekodunmi aka General Pype just became a proud father of a baby boy, with his American girlfriend. The baby boy has already been christened Xavier. Pype’s baby boy was born on October 1, 2013 and reports say the child was delivered in a US hospital. “Thank You Baba Loke! 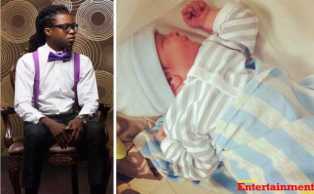 I am now a DAD Toh skibborious”, General Pype joyfully announced on Twitter. Sources close to the artiste say General Pype and his US baby mama nicknamed Zee, met some years back In November 2012. General Pype is presently in the US to celebrate the birth of his child with Zee’s family. Zee also makes trips down to Nigeria and even met with General Pype’s mother a couple of months ago. T-CHIDI Is My Friend – Nuella Njubigbo Confessed!